It's going to surprise a fair number of you when I say this, given my reputation for having some pretty tough standards for hip-hop... but I've got a bit of a soft spot for Kid Ink. And for the life of me, I have a really hard time understanding it. I mean, I get why I like certain artists as a critic: my love of country comes from my fondness for Westerns, good bourbon, and better storytelling, my liking of folk and power metal can be directly linked to the wall of fantasy novels in my apartment, my passion for space rock and progressive metal comes from my sharper, more analytical side that also deeply loves sci-fi, and my taste for gothic music in various forms from symphonic metal to post-punk comes from the appropriation of religious iconography and darker moods that I find compelling. My love of punk from my anarchist days in high school and university, my fondness for boy bands comes from the years I've been singing karaoke and vocal harmonies, and hell, even my liking of an act like Kesha comes from an outgrowth of a wilder, trashier side of pop music that reminds me over of the over-the-top earnest cheese of hair metal more than anything else. But Kid Ink? As a critic, I've struggled with why I've tended to like his material more than most from objectively more polished and skilled rappers. His writing is not stellar, his concepts are not unique, and he arguably has less personality than many of his features. So why am I more inclined to give him a free pass over, say, Nicki Minaj? Well, part of this comes down to artistic intent, in that I don't think Kid Ink's trying to make music that's more than simple club rap, and in that area, he's extraordinarily competent. His flow and technical rhyming ability isn't bad, he has some good production with melodic hooks, and while he can definitely be sleazy, he tends not to push his luck as much as, say, Lil Wayne does. I'll say it, I liked Kid Ink's sophomore record My Own Lane - it's not a great record and he still works with Chris Brown more than any artist should, but at the end of the day, the album does exactly what it's designed to do, and on that merit, I have a hard time calling in a failure. Yeah, he doesn't have as much personality as a duo like Rae Sremmurd or an artist like Young Thug, but his technical skills are better and the personality he does have doesn't make me want to set things on fire. That said, I wasn't exactly looking forward to this. Early critical buzz was suggesting that Full Speed was a step down from his last album, and his most recent features and tracks haven't exactly impressed me. And let's be honest, there were an awful lot of guest stars on that track listing that didn't exactly enthuse me. But then again, I did like My Own Lane, so I gave Full Speed some listens - was it any good? Well, I can say this, if anything, Full Speed gave me an idea of what Kid Ink wants to do with his music and in a way it's kind of ingenious because it's the sort of plan that seems designed to print money. But putting aside how incredibly marketable it is, does this mean we actually get a good album? Well, as I said earlier, it's about expectations, and while I can't say it's better than My Own Lane, it still mostly accomplishes what it's trying to do - I'd just argue it's not as enjoyable. So let's start with Kid Ink himself, and really, there's not a lot to say. As I said, he's extraordinarily competent - he doesn't have a lot of personality or emotional range beyond trying to be the chill club VIP that's having a good time, and to his credit, a lot of that is built off of keeping his solid sing-song flow going as long as he can. Where I feel this album takes its first misstep, though, is in Kid Ink's choice to go darker, especially trying cultivate a more subdued, menacing vibe. To be blunt, I don't buy it for a second. Sure, I get the songs where Kid Ink is obviously trying to follow in the footsteps of Drake or Kanye to cultivate that eerie, subdued vibe, especially in his flow which can bite pretty heavily from both of them, but while he manages to ride these beats well, most of his material is just too lightweight and some of his bars are too cheesy to buy against production this dreary, minimalist and dark. Kid Ink is at his best when he's just aiming to party or have fun, build that populist vibe, and thus putting him in situations where he's trying to brag just aren't as fun. Granted, a lot of this comes to the production and instrumentation, where the most changes have taken place. Now one of the greatest strengths of Kid Ink is a knack for solid, melody driven production, and to be fair about a third of this album makes it work. The opening track 'What It Feels Like' with the horns on the hook, the roiling drums and guitar lick of 'Faster' that was likely sampled wholesale from a progressive rock tune, the bouncy synth line of the R.Kelly collaboration 'Dolo', and the brittle percussion and swelling waves of interweaving keyboards on the collaboration with Chris Brown 'Hotel'. But it's here where if you listen to 'Faster', you'll probably pick up that between the rougher filters and the sample, it's very reminiscent of Kanye West - and when you pair it with the fact that DJ Mustard and a fair few imitators contribute songs to this album, Kid Ink's strategy comes into full view: taking beats and production that frankly are a lot better than anyone would expect for this sort of material and making them into club-friendly shallow radio tunes. And hell, even when you go into the darker material, even if I don't think he's a good fit for the beat he still picked good production - the oscillating drum line at the back of the cavernous 'Cool Back', the pummeling thickness of 'Round Here' and especially the horn-accented weed anthem with the drill-like percussion and solid melody of 'Blunted', these are good instrumentals. If I'm going to point at weak instrumentals, it'd be the songs that DJ Mustard picked the most twinkling, underweight keyboards possible or the rain-soaked 'Like A Hot Boy', a collaboration with Young Thug that features a synth tone that needed more depth and just sounds gross against the muted piano line. And I might as well talk about the guest stars, and sadly, most underperform here. The first immediate disappointment is R.Kelly, whose verse on 'Dolo' wasn't bad but included this lyric, 'Body so dumb I call that body dodo' - and while I get the comparison, saying this girl is so incredibly hot it's stupid, but the comparison to the dodo, a turkey-like flightless bird that was so stupid and delicious it was hunted to extinction... I give R.Kelly's insanity a lot of passes, but not for this one. The bigger disappointment is the pitch correction and complete lack of any sort of expanded vocal range, which happens to Usher too on 'Body Language' - when you hire two of the most charismatic R&B stars in the industry and you don't get them to belt, that's just wasting talent. And on the topic of 'Body Language', I had hoped that by including Tinashe they would actually give her some bars, let her fill the Jhene Aiko role like on 'Post To Be' with Omarion and Chris Brown, but she's basically a glorified backing vocalist here. Dej Loaf continues to not impress me on 'Be Real', but the real disaster is Trey Songz, who just sounds terrible on 'About Mine' as he contorts his voice that reminds me more of Rae Sremmurd than it ever should! And then there's Young Thug and Bricc Baby Shitro on the closer, and while they both actually do match the beat, none of their bars are all that memorable and Young Thug sounds half asleep. The only guest stars that work here are - much to my shock - Migos, who aren't terrible and actually show more imitation of Kid Ink's flow than the other way around, and Chris Brown on 'Hotel', where the two are trying to juggle the awkward situation of having both their girl and their ex at the bar at the same time. And if the guest star is designed to make the artist look good, Chris Brown fumbled attempts to keep the balance are nowhere near as convincing as Kid Ink trying to parlay the whole endeavor into a three-way only if his girl is cool with it, and you know, it's not all that badly done. But now we need to talk about lyrics - and look, with this sort of album it's all about flow, keeping things fun, which is why I'm not sure going for darker, more serious and heavy production was the right choice. And thus on some level it makes sense that Kid Ink goes for more braggadocious material, like on 'Faster' or 'Cool Back' or the tour life of 'Every City I Go', but when you get tracks like 'Round Here' where he's bragging about taking other guys' girlfriends or excluding people from his VIP section, he gets a lot less likable. Considering so much of this album is built off of a pop rap template, Kid Ink needs populism or at least focus to keep him from becoming insufferable - hell, it's why I actually kind of dug 'Blunted' - as a weed track, it's was better written and more detailed than anything Wiz Khalifa has dropped recently, and the wordplay wasn't bad. But it's here where I started thinking about the real contradiction with Kid Ink, in that he is a technically skilled rapper with more than a few good lines and he's got a really solid flow and cadence - but while he's showing more ambition with his beats, his content hasn't really evolved with them, even within the party vein. Part of this might be him juggling the guest stars that the label likely shoves on him to compensate for his limited personality, but really, I'd want to hear a Kid Ink project he did entirely on his own, where he could flesh out his personality and verses to match his production. Unfortunately, that'd likely compromise the steady money-making formula he's got going, so I'm not sure i see that happening, at least not all at once. 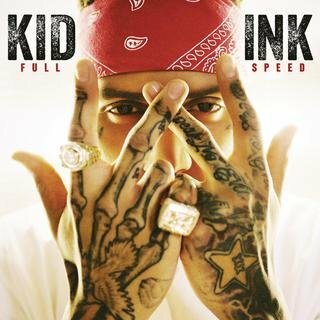 So in other words, Full Speed by Kid Ink feels like a record in transition, and as such it feels more fragmented and slightly weaker than My Own Lane. As I've said, judging by the standards of pop rap the majority of this album does what it's designed to do, and I know that a lot more people could probably groove to the darker songs more than I do, but I don't think swapping out populism for arrogance is a good move, not less he really amps up his wordplay to earn that shift. And thus to me, this record is a 5/10 and something of a recommendation, but only if you're looking for a lightweight party record, nothing more, nothing less. To me, Kid Ink does seem to have ambition, but if he wants to elevate himself into the pantheon of recognizable rappers, he needs to step his game up, and really push the pedal to the metal.